I love gadgets, particularly those that will make my life easier, more comfortable and safer while I'm traveling. So when I found out about a pen-shaped small device that can purify water in seconds, I bought it. I've been in situations where the tap water is not drinkable and it's the middle of the night and no bottled water in sight. Or I've been hiking and can't find any potable water and I don't want to deal with foul-tasting tabs or the hassle of a pump purifier. SteriPEN is the product I rely on. It uses UV light to purify the water of all manner of disease-causing organisms, including the dreaded Giardia parasite. It has been extensively tested and it kills more than 99.9% of bacteria, viruses and protozoas, like Giardia. I carry it on many of my trips and, it's so small, it's easy to pack in my sole piece of luggage that I carry-on. What a Trip. Visit the blog and comment on today's post for a chance to win an Otterbox cell phone case or a Baseline 20-inch carry-on expandable wide-body upright suitcase. Hi Jeanine this looks quite useful! Hi Max, Great to hear from you. Yes, the SteriPEN is an amazing device. Makes purifying water super easy. I agree! 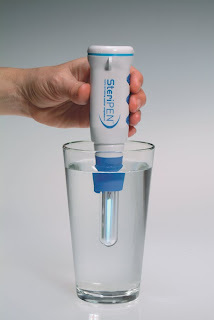 I've used the Steripen in Peru, Mexico and Nepal and it works wonders! Hi Peter, Cool! Glad you're a SteriPEN fan too. Only, it makes me pine for travel. Hi Chris, Thanks so much. Glad you like the blog. I'm always pining for travel too, as soon as I return from every trip! It's good to know that this works. I had seen this item before, but was a bit wary of trying it (the downside of it not working is huge!). I will put it on my Xmas list! Hi Jennifer, I absolutely know what you mean in terms of the downside if it didn't work. Glad it does. Wow! I could totally use one of these - I'm going to India later this year. Thanks for the tip! It's a great item and I think most people should take them everywhere they go.